Feel like you need a little relaxation? Want your shoulders to drop back down to their natural position and not up round your ears!? Our Mum and Baby Yoga classes are fabulous, you will feel great, be walking on air when you leave .... and the bonus of this session is it is shared between you and your baby. 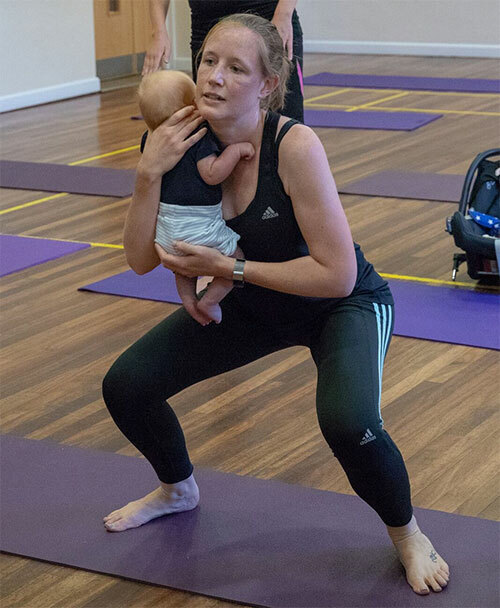 Our carefully planned classes allow lots of time for you to encourage some flexibility, lengthen muscles and put your posture back in place .... alongside yoga movements for you to enjoy with your baby. A truly lovely class, a great way to get back into movement in a non judgemental environment – you don’t need to have been to any type of yoga before! This class is often a great reintroduction to movement and exercise after your baby is born but unlike other classes, you can continue right up until your baby is walking. And we do have Mums that love our sessions that much they come back when their tots are at preschool! Yoga for babies has lots of benefits but it is particularly beneficial when they are relatively sedentary as it aids cross lateral movements, co-ordination and muscle development. Please bring water and wear comfortable clothes. This class will be taught with no shoes or socks.